Like Google searches for M.I.A. after her Super Bowl middle finger salute, the growth of Pinterest is positively ferocious. A 329 percent increase in unique visitors in 90 days is the kind of rocket ship acceleration that is usually far more myth than reality, even in social media start-up circles. Why this newfound obsession with Pinterest? What’s fueling this rocket? There are actually several factors and features that have made Pinterest on par with Twitter as a traffic driver (according to a Shareaholic study). Unlike many other contemporary social environments that seem hell-bent on adding features like ornaments on a Christmas tree, Pinterest does one thing, and does it well. They have embraced the less is more ethos that initially propelled Google search and Twitter to the forefront of their respective fields. Ease-of-use is the killer app. Pinterest would never have crossed the chasm to become the darling of the often non-technical crafting and fashion crowd if it was a hassle to figure out. It’s drop-dead simple, possibly because of its focused features, as is impacting Web design best practices in widespread and profound ways. Pinterest allows us to chronicle and share what we love. Our hobbies. Our desires. Our aspirations. I don’t have data on this (it would make an interesting study), but I’d wager a considerable sum that there are 10x more pins of things we want, compared to things we have. It’s akin to the Facebook “like” phenomenon, but with a far more visceral psychological anchor. You can enjoy Pinterest without reading anything. Let that marinate. In a world where the tweet and status update have reigned supreme for years, you can now can fully immerse yourself in a powerful community experience that is 100% visual. It’s no wonder that Pinterest broke out at roughly the same time as Instagram, Path, and other social sharing opportunities that revolve around pictures, not words. (see post from Ekaterina Walter on whether photo apps will kill the written word) It’s the natural evolution of communication. A picture may not be worth 1,000 words, but it’s definitely worth 140 characters, and when the vast majority of the population began possessing a camera at all times via their mobile phone, this type of photo-driven culture was a natural byproduct. There are no Sneetches with stars and Sneetches without stars on Pinterest. Brands have pages and access to the same features that individual users have. This democratizes the community in an important and powerful way, making Pinterest the only major social opportunity (other than Twitter) where people and companies are singing from the same hymnal. Strangely, Twitter aims to eliminate their edge in this area by rolling out brand pages to companies. Those are the five primary reasons for Pinterest’s success. But I advise that you temper your passion for Pinterest, as there are four reasons why the site as we know it today may not survive. One of the digital marketing advantages of Pinterest is the fact that all links on the site are followable by Google and other search engines. On a pin, the from link, the image link, and even the description link (if you insert one) are all followable by Google, passing juice back to your site. This is too good an opportunity for SEO pros to pass up, and link spam on Pinterest will pick up significantly in the next few weeks. Pinterest will likely have to change links to no-follow, or risk SEO spammers dragging down the quality of the user experience. On a related front, the affiliate marketing opportunity on Pinterest is astounding. 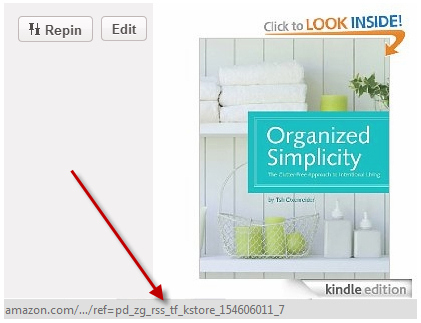 Already, you can set up an API feed of Amazon’s top sellers (or other products) onto a Pinterest board, create a potentially lucrative, automated revenue stream. This is going to explode soon, with a potentially overwhelming number of low quality, affiliate boards cropping up like mushrooms. Even Pinterest itself is getting into the act, inserting affiliate links automatically wherever it can do so, using Skimlinks. Again, this commerce-first shift may threaten the idyllic user experience that has made Pinterest successful. The fact that Pinterest is so focused is terrific (see #1 above), but also makes it far easier to copy it’s offering. Like daily deal sites aping Groupon, Pinterest is massively prone to other sites chipping away at its user base by creating more relevant offshoots. Already, you see clones like Gentlemint.com vying for the “Pinterest for dudes” audience, and angel investor online community Angel List includes several companies that describe themselves as “Pinterest for Architects” “Pinterest for Beauty” and so forth. The most likely reason that Pinterest as we know it today will disappear is that it’s simply too ripe for acquisition. Suitors are plentiful, as Pinterest makes tremendous strategic sense for many social behemoths, but for different reasons. Google could buy Pinterest to add pins and repins as a social signal for photos, serving as a de facto +1 for images and adding an entire new layer of relevancy to Google images search results. It would be a tidy add-on to Google Plus as well, and give it a meaningful advantage over Facebook. For that matter, Facebook could buy Pinterest and make it the core of its still nascent social shopping efforts, giving Facebook pages an easy way to monetize “likes” at the product level. Twitter could buy Pinterest and make boards and pins part of users’ profile page, taking today’s uninteresting “Recent Images” to an exciting new place. Groupon could get into the game, using what you’ve liked and pinned as a relational database to improve the relevancy of deals you’re offered. Certainly, in the interest of possessing a revolutionary new social commerce front-end, Pinterest would be attractive to Amazon, and probably eBay as well. Even Wal-Mart – which has quietly been getting very serious about social – would be an interesting and viable candidate. I’m not a crafter or a fashionista (my first Pinterest board was favorite tequilas, and my most popular board is social media infographics), so I don’t fit the profile of the typical Pinterest freak. But, I love and very much appreciate the site for the five reasons I’ve mentioned. However, for the other four reasons I’ve articulated, I fear our relationship will be short-lived.